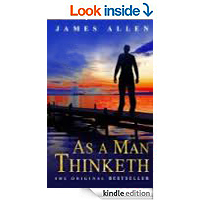 Drawn from the Biblical text which reads, “As a man thinketh in his heart, so is he,” James Allen’s work As a Man Thinketh has been for over a century a guide and inspiration for those who need direction and to find their path in life. Allen makes the bold yet simple assertion that a man can be successful if he thinks it’s so, and a man will fail if he thinks that, too. This work may be brief, but its timeless message of hope and empowerment compels readers to stand up and take responsibility for their own success.